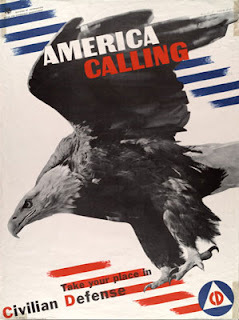 EagleSpeak: Cushing Day: Sink the Albemarle! October is a great month in the history of the United States Navy. The U.S. Navy was founded on October 13, 1775. USS Constitution, "old Ironsides", still in commission, was launched in October 1797. The "greatest sea battle" of all time was fought in and around the Philippines - the Battle of Leyte Gulf was fought from October 20, 1944 (it began with the allied landings on Leyte) and ran through October 26. And saw the end of any real Japanese surface navy threat and the rise of the kamikaze air attacks. And every surface line officer knows that it was probably the last time that "crossing the T" was done to bring all guns to bear on an enemy fleet. And in October 1962, the world was about as close to full out nuclear war as it has ever come, as the Soviets and Cubans attempted to place nuclear tipped missiles on Cuban shore and the U.S. responded with a naval blockade of Cuba and brinksmanship made both sides blink- during the Cuban Missile Crisis". These great events sometimes overshadow the smaller stories of men at war, hiding the stories of individual actions and personalities that form themselves in courageous acts. A vital link in the serpentine chain with which the Union government was slowly squeezing the life out of the Confederacy was the thousand-mile blockade of the southern coast line. If this were broken, permitting the Confederacy access to the outside world, the Union cause would inevitably fail. Among the tools the Confederate Navy tried to use to defeat the blockade were its newly developed ironclad ships. These ships were designed to withstand shelling by the Union Navy ships and ram the relatively fragile hulls of wooden blockade ships, sinking them and ending the blockade. 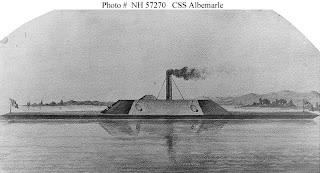 The Albemarle was built on the Roanoke River in 1863. She was of light draught, but of considerable length and width, her hull above the water-line being covered with four inches of iron bars. 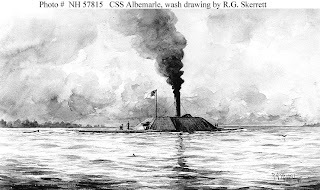 The CSS Albemarle was commissioned on Sunday, April 17, 1864. Her captain, Commander James W. Cooke, was ordered to immediately begin her trek downstream. Cooke, who previously held the responsibility of overseeing the construction of ironclads built in North Carolina, had been appointed as her captain in January. Despite the fact that the Union Navy command in New Bern had been warned by spies that the Albemarle was on her way downstream, Cooke managed to successfully maneuver around Union-laid obstacles including a gauntlet of sunken hulls, pilings, torpedoes and cannon shot. Two days after leaving the Edwards Ferry yard, the ironclad Albemarle, with her tender ship the Cotton Patch following close behind, arrived offshore of Plymouth. At 4:07 a.m. on April 19, Cooke ordered the Albemarle's gun crew to load solid shot and standby. Through the misty twilight he had spotted two approaching Union vessels. As the enemy grew closer he could see that the two ships were linked together with "hawsers and chains." It quickly became obvious that the Union captains planned to snare the Albemarle with their chains trapping her between their vessels so the ironclad could be boarded and possibly captured. Cooke ordered the Albemarle "all ahead full," sending the 376-ton ironclad straight for the space between the bows of wooden hulled Union vessels. Heavy guns from the two Union ships, the USS Southfield and USS Miami, pounded the Albemarle with shot. In a few seconds, the Albemarle had traversed the river, feinted at the last moment and rammed the Southfield hard at her port bow. 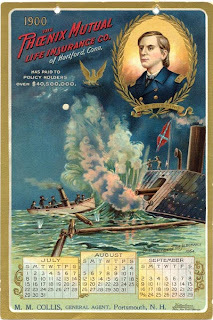 The Albemarle's ram crashed 10 feet inside the Southfield's hull, causing the Union ship to start sinking immediately. The Southfield suddenly listed to starboard, causing the Albemarle's bow to become jammed in the hull. Cooke ordered "all astern full," hoping that full reverse thrust would relieve the Albemarle's bow and ram from the sinking Southfield. To his horror, the Albemarle's ram remained stuck. The ironclad began to sink with the Southfield, her bow depressed under the sinking ship. The Albemarle's forward deck was depressed so low that water rushed into her forward port. Crewmen on the Southfield were abandoning ship. Some were attempting to lower small boats. Others were leaping into the chilly water. The normally quiet morning twilight was filled with un-muffled shouts, screams and curses of Union sailors abandoning ship. With the Albemarle stuck fast to the Southfield, the Miami's Captain, Lt. Commander Charles W. Flusser (also the Senior U.S. naval officer at Plymouth) ordered several broadsides fired into the ironclad's port casemate. The shots ricocheted off the iron plates of the Albemarle, careening harmlessly into the water. He jumped behind the Miami's bow-mounted XI-inch Dahlgren cannon, and personally fired the big gun pointblank at the Albemarle from a range of about 30 feet. The shell slammed into the ironclad's casemate, ricocheting back and exploding directly over Flusser, killing him instantly and wounding several of the gun crew. Cooke, still unable to use the big guns of the Albemarle because of her unfortunate predicament of being stuck to the Southfield, ordered his crew to climb to the top of the casemate where they engaged the Miami's crew in a brief but brisk small arms skirmish. Finally, the Southfield's hull hit the bottom of the river. She rolled slightly, releasing her death grip on the Albemarle. Cooke quickly reversed out and maneuvered the Albemarle for an attack on the Miami. The Miami, however wanted no more of the Albemarle. She reversed her engines, then retreated at full speed. By 5:11 a.m., as the sun began to cast rays over the waters of the Roanoke River at Plymouth, the Albemarle's first battle was over. She had suffered only one casualty - a crewmember identified only as "Harris." That unlucky Confederate received a pistol shot from a sailor on the Miami when he succumbed to curiosity and took a peek out of one the ironclad's gun ports. Cooke navigated the victorious Albemarle to a point one mile below Plymouth where he dropped anchor and allowed the crew to recover and prepare their ship for another battle. His "iron sharpshooter battery" and tender ship, the Cotton Plant, which had remained above Plymouth while the Albemarle engaged the enemy, was now anchored close by the ironclad. During the War Between the States, Plymouth became a focal point for both the Union and the Confederacy because the Federal naval blockade tightened it's hold on the Confederacy with each passing year of the war. Being a strategic port, Plymouth gained added significance. It was believed to provide the easiest access to the vital Wilmington & Weldon Railroad. This crucial rail link which ran from Wilmington, NC to Richmond, VA was the "lifeline of the Confederacy", supplying Lee's Army of Northern Virginia. By 1864 the Federal fleet had closed all of the significant Southern ports except Wilmington, NC, which was guarded by the "Confederate Goliath", Fort Fischer. Therefore, this vital railroad became the focus of the Union and the Confederacy. Plymouth, being occupied by the Federal Army and Navy since 1862, was a jumping off point for attempts to cut Lee's supply line, the Wilmington & Weldon Railroad. Confederate Fort Branch located at Rainbow Bluffs above Williamston on the Roanoke River effectively blocked the river route. Numerous unsuccessful attempts to reach the railroad bridge at Weldon were made by the Plymouth based Federals. Finally, in early 1864 Robert E. Lee agreed to spare his trustworthy Brigadier General, Robert F. Hoke, from service in Virginia to rid the coast of North Carolina of Union occupation. Hoke was on a tight timetable because Lee needed him back in Virginia before the summer campaign. With 13,000 troops and the promised support of the ironclad ram, the CSS Albemarle, Hoke began his attack on Plymouth late in the afternoon of April 17, 1864. Plymouth was defended by approximately 3,000 Federal troops under the command of Brigadier General Henry Wessells. 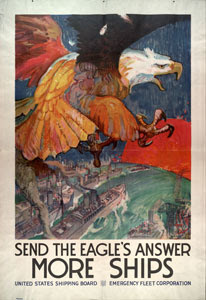 The army was supported by the Federal Navy under the command of Charles Flusser. After a full day of hard fighting on April 18th, some of the Confederate troops were becoming demoralized due to the heavy beating they were getting by the Federal Navy's gunboats and the stiff resistance from the well entrenched Federal Army defending Plymouth. Then in the early hours of April 19th the CSS Albemarle came to the rescue, steaming down the Roanoke driving the Federal Navy from the river. Commander Flusser was killed and the USS Southfield was rammed and sunk. The Federal army was surrounded now on land and river, but held out until 10:00 a.m. on April 20th, when General Wessells surrendered. 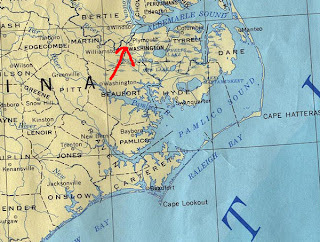 With the ironclad Albemarle controlling the river, the vital port could be kept open for the Confederacy. But the death of Commander Flusser angered one his friends, Lt. William Barker Cushing. The plan was approved, and the Lieutenant withdrawn from the Monticello to perform this special service. Since that date Admiral LEE has been succeeded by Admiral PORTER, who has signalized his assumption of command by the destruction of the ALBEMARLE. After the conception of his plan Lieutenant CUSHING came to New York, and, in conjunction with Admiral GREGORY, Captain BOGGS, and Chief Engineer W. W. Wood, applied to one of the new steam-pickets a torpedo arrangement and returned to the Sound. The Albemarle was moored some eight miles from the mouth of the Roanoke River, at the wharves of Plymouth. On the night of October 27, 1864, a pitch-dark rainy night, Cushing slipped away from the blockading fleet on his perilous and desperate errand. Cushing went up-stream with the utmost caution, as the success depended upon silence and surprise. By good luck he passed unnoticed a Confederate lookout below the ram. The Albemarle was protected by a great boom of logs thrown out about thirty feet from her, on purpose. to prevent such an attack as Cushing had in view. Feeling his way cautiously he finally made out the boom of the Albemarle, and at once drove at her. But as they neared the landing the barking of a dog aroused the sentry. The shots were singing around him, as he stood erect guiding his launch. The noise of the great guns could be heard as they were made ready. The second attempt to reach the ram was successful. 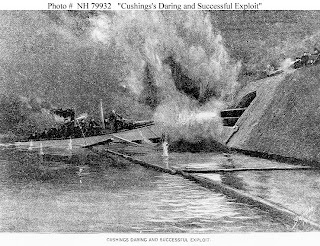 As the boat slid forward over the boom he brought the torpedo full against the side of the powerful ram, and instantly exploded it, within ten feet of the muzzle of the hundred-pounder, which was depressed as rapidly as possible to blow Cushing and his boat out of the water. The explosion and the discharge of the Albemarle's gun was simultaneous. The ram at once settled, and the launch sinking at the same moment, Cushing and his men threw off their coats and plunged into the water, striking out for the middle of the river. From river to swamp and woods, and finally swimming besides a small, square-ended boat out of the sound into the sea, when coming within the hailing of our ships, Cushing gave the "ship ahoy," and was picked up by the Valley City. Cushing's whole career shows him as a man of great courage and energy and, as Admiral Farragut said, " While no navy has braver officers than ours, young Cushing was the hero of the war." Passing her closely, we made a complete circle so as to strike her fairly, and went into her bows on. By this time the enemy's fire was fairly severe, but a dose of canister at short range served to moderate their zeal and disturb their aim. Paymaster Swan, of the Otsego, was wounded near me, but how many more I know not. Three bullets struck my clothing, and the air seemed full of them. The most of our party were captured, some were drowned, and only one escaped besides myself, and he in another direction. Lt. Cushing was much honored in his day. Fittingly, the U.S. named a motor torpedo boat (TB-1) after Cushing. In addition, a number of destroyers have borne the Cushing name, one of which (DD-376) was lost off Guadalcanal in 1942. DD-797 saw action in both WW II and Korea. The fifth USS Cushing, a Spruance class destroyer, was decommissioned in 2005. A small salute to a naval hero and the men who took up his challenge to engage the enemy.